Eating a banana on a daily basis is beneficial in so many ways. Bananas are rich in vitamins and nutrients that provide nourishment for our mind and body. But most of us, eat a banana in the following way: peel the banana, eat the banana, and throw away the peel. Well, we are here to tell you that is the wrong way of eating bananas. Do not throw away banana peels. Let’s repeat it once more. Do not throw away banana peels. When you read the benefits of banana peels, you might think, this sounds weird. Well, actually, it is not. Before you throw away the peel of a banana, read this. The banana peel, which is often called banana skin, is sometimes used as food for animals. But it can bring so many benefits to our skin and body. One of the main benefits of banana peels is that they are anti-inflammatory. That means they can relieve symptoms of itchiness and inflammation. These symptoms are usually associated with skin conditions like psoriasis and eczema, and of course, acne. But because it is rich in potassium and antioxidants, banana peels can help relieve these symptoms. And even help you get rid of acne. We all know that sun exposure is good and bad. It is good because it helps your skin produce vitamin D. But too long sun exposure can cause harm, and also start the aging process of your skin sooner rather than later. Applying sunscreen is a must, but banana peels can also help protect your skin from harmful UV rays. That is because the banana is rich in vitamin C, which is an excellent source of antioxidants. In other words, the banana peel is a natural sunscreen. Puffy eyes or dark circles under your eyes can be harmful to your self-esteem. Nobody wants to go out looking tired, fatigued, and dull. Makeup cannot cover those puffy eyes in most cases. So, what can you do? 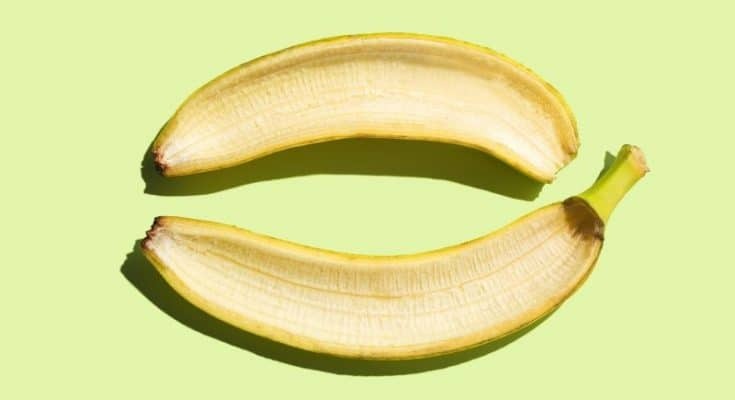 Well, banana peels are some of the best natural remedies. Rich in potassium, banana peels helps eliminate the external salt on your skin. Salt is responsible for fluid retention and the look of puffy eyes. And they can also eliminate dark circles under the eyes. We mentioned previously that banana peels can help with sun damage that causes premature aging of the skin. The peels can also reduce the visible signs and symptoms of aging, wrinkles and fine lines especially. Rich in antioxidants, banana peels can prevent cell damage in the skin, and fight off free radicals. Reducing the damage of free radicals is essential in achieving glowing, radiant, and younger looking skin. Banana peels can help with that. Who doesn’t need extra moisture for their skin? Right? Well, we’ve got some good news for you. The peel o the banana can help add more moisture to the skin and help dry skin in the process. That is all thanks to the potassium in the peel, a mineral that is great for hydration and moisture. Banana peels can also help you achieve sparkling teeth. No matter what is the reason for some dirt and debris in your teeth, banana peels can help them sparkle. Do you want whiter teeth? Try some banana peels. If you have pain in any part of your body, apply banana peels on that. Thanks to its anti-inflammatory properties, the peels can help. Of course, this remedy is not for pain caused by surgery or something similar.